Product #15715 | SKU RS-BMGC | 0.0 (no ratings yet) Thanks for your rating! The RS-BMGC Rain Slicker from Porta Brace is custom-made specifically to protect your Blackmagic Cinema Camera from rain and dust. Its exterior is crafted from water-resistant, breathable 1000D nylon taslan, which keeps the camera dry while preventing overheating. The soft tricot interior ensures that your equipment isn't scratched. A clear Vinyl window provides an unobstructed view of the camera's controls. 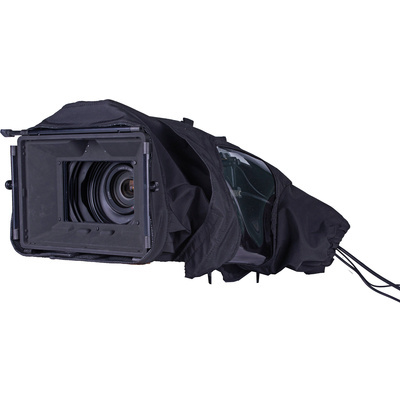 The rain slicker's front end can accommodate either a standard lens or a matte box. The RS-BMGC fits on your camera whether you're shooting handheld or using a tripod.